Oh yes. Good ol' Darth Vader. If you recall, I have a storied history of not being able to properly draw Darth Vader. Like, my problem with this picture of him is that he still looks slightly off-model. Like, his head is not big enough or his eyes don't look quite right, or something. I think the reason is that Darth Vader's design is very mechanical looking, not unlike a car. It is sleek and each line and curve bleeds into the next one; so every line needs to be perfectly placed. However, I am not good at drawing precisely. When I draw humans, it is easier to hide that artistic flaw because humans physically don't look perfect to begin with. The other issue with this picture specifically is that I totally forgot how to make the light source consistent. Sometimes, it is bouncing off the right side of his face and sometimes it bounces off the left side. 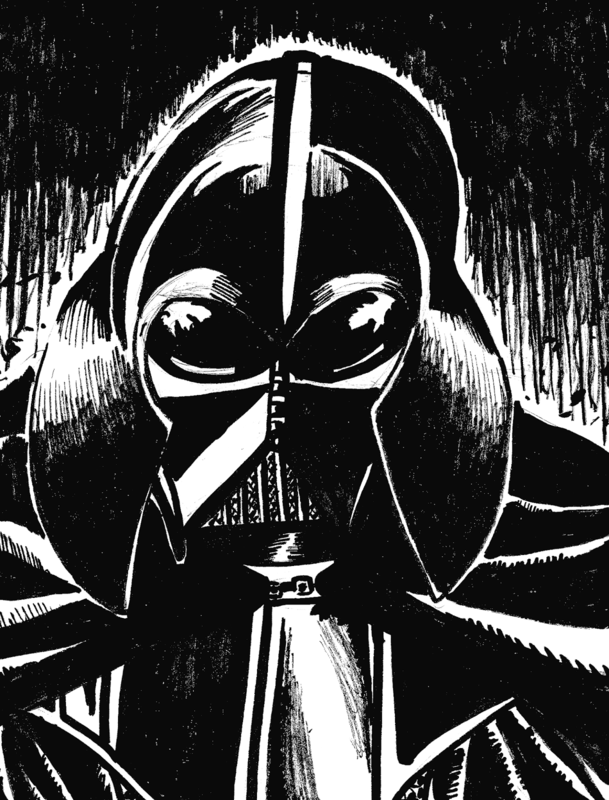 The good things that I do like about the picture is that I like is the sense of shadow that I made for Vader. I also took the time to darken the whole picture, so the shadows bleed into each other, giving a really dark feeling. As random as it is, I really enjoy the way his clothes fold onto each other. When drawing his clothes, I was conscious of the idea of how the light falls on the folds of his tunic and cape. And it looks pretty darn good.